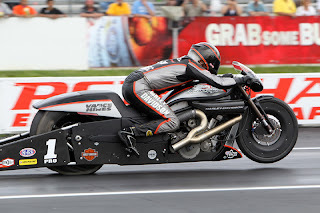 ENGLISHTOWN, N.J. — Harley-Davidson® Screamin’ Eagle®/Vance & Hines rider Ed Krawiec rode a Harley-Davidson® V-Rod® motorcycle to an emotional Pro Stock Motorcycle class win at the 43rd annual Toyota NHRA SuperNationals at Old Bridge Township Raceway Park. A native of the area and the former manager of the racetrack, Krawiec had never scored a Pro Stock win at the venerable New Jersey drag strip. Krawiec has won three of four events in 2012, and the Harley-Davidson® Screamin’ Eagle®/Vance & Hines team is undefeated on the season, as Screamin’ Eagle rider Andrew Hines got a win the one time Krawiec did not make the final. As if he needed icing on the cake, Krawiec also twice set a new Elapsed Time track record in Friday qualifying, running a 6.794-second Elapsed Time in the first round and besting that mark with a 6.782-second blast in the second round. Hines qualified the team’s other Harley-Davidson V-Rod in sixth position at 6.874 seconds. In Sunday eliminations, Hines beat Geico Suzuki rider Karen Stoffer in the first round, and then lost to Lucas Oil Buell rider Hector Arana Jr. in round two, running 6.934 seconds to 6.858 for Arana Jr.
Krawiec opened eliminations with a free pass when Joe DeSatis fouled at the start on his Suzuki. Krawiec then bumped off two former class world champions, beating Matt Smith Racing Buell rider Matt Smith in round two and advancing in round three when GT Racing Suzuki rider LE Tonglet fouled. That set up a final-round match with Lucas Oil Buell rider Hector Arana Sr., the number-two qualifier who had one of the quickest bikes in the field on Sunday but who also had a series of late reaction times at the start that resulted in very close wins. In the final, however, Arana left 0.052 seconds early to hand Krawiec the 14th win of his career. With three wins in four events, Krawiec now has 466 points and a 141-point lead in the 2012 Pro Stock Motorcycle standings. Hines remains in second place with 325 points. Arana Jr., who lost to his father in the semi-finals, is third with 301 points, followed by Hector Arana Sr. with 293 points and GottSpeed Racing Buell rider Michael Ray with 235 points. The Pro Stock Motorcycles will next race on June 28 - July 1 at the 15th annual O’Reilly Auto Parts Route 66 NHRA Nationals at Route 66 Raceway in Joliet, Ill.